I cannot say enough about how much we enjoyed this trip. My wife and I took our three teenage children (20, 17, 13) and had probably one of the best family vacations we have ever had (and we travel). Four days of no cell phones, no TV, no movies and just family fun. We talked, laughed, took pictures, hiked, camped and literally were about 2 feet from each other for 4 days. Cataract Canyon is spectacular. You'll literally float down about a billion years of geology and see things you can't see anywhere else in the world. It was humbling and spiritual to see a part of the world as it was a billion years ago. A true national treasure. The guides were incredible people (Tori, Ryan, Alex and Derek). They did everything for us from keeping us safe on the rapids, to cooking meals, to explaining the geology of the canyon. They are all role models for any young person-- friendly, engaging, interesting, funny and empowered by the company to do anything to make the guest experience a life changing event. We all enjoyed every second around them (especially Tori playing guitar and singing at night). I'm still trying to figure out how they served ice cream on day 4! No detail is spared. It's hard not to sign up for next year and do it over and over. Seriously, a one of a kind experience. BTW-- if you are going down this trip (or the Canyon), make sure you read the Emerald Mile by Kevin Fedarko BEFORE the trip. Really brings it all alive. A huge THANK YOU to Western River Expeditions for a wonderful experience. We'll be back. 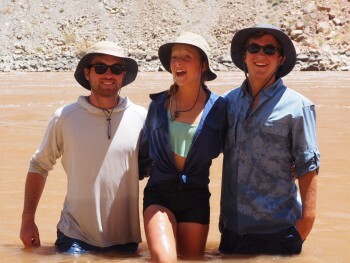 PS- the picture is of our three kids having a blast together in the river. So many stories.